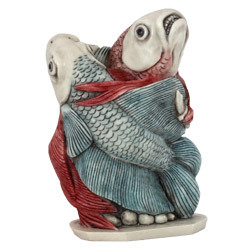 Master Carver Peter Calvesbert has carved two of the most glorious freshwater aquarium fish, in a fixed edition of 200. "It's not only drunken Englishmen staggering out of pubs that like to fight. The Siamese fighting fish also likes to scrap. You don't seem to see as many bloodied fish at the local A&E on a Friday night though," says Peter. Rather than the traditional noble art of biting, his fighting fish mimic our culture by brandishing knives and broken bottles. The interior depicts a much kinder world where the two fish settle a dispute over a civilized game of checkers. Inscribed on the lid is their Latin name, "Betta splendens." The "Rumblefish" inscription refers to a late night cinema double bill Peter attended in the 1980's – an odd coupling of David Lynch's "Eraserhead" and Francis Ford Coppola's teen favourite "Rumble Fish." The Coppola film was shot in black and white, except for one scene in color with two Siamese fighting fish in a pet store. Peter grew up in an age when conjoined twins were called Siamese twins. Curiosity led to research, and he found that Chang and Eng (from Siam) were famous conjoined twins who travelled with P.T. Barnum's circus in the nineteenth century. Because of their fame, the term "Siamese twins" came to be used.